National Year of Reading - May theme - Escape! The National Year of Reading's May theme is Escape, whether it's escaping into the world of reading, or reading to escape from the world. Now is the time to sit down and read (or re-read) something you love, something that allows you to escape into another time and place and connect with different characters and settings. You may like to read about escaping from prison or poverty, or read something that allows you to escape from the mundane of day to day. 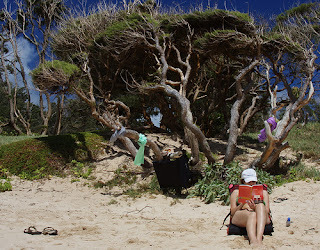 Read about escaping to a desert island, a dystopian world or a brighter future. Read about escaping reality by visiting exotic lands, or try a biography about a famous person you are unlikely to ever be able to meet. Create a reading sanctuary that you can escape to, and spend some time there reading; at least ten minutes a day. This month, only get caught reading. Photo credit: Flickr user Shayan(USA) "Malaekahane State Recreation area"